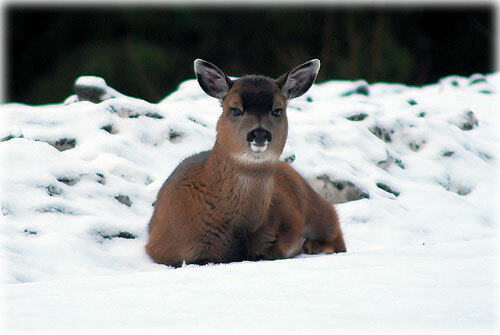 This young Sitka Black-tailed deer is resting in the grandiose silence of the snow on Prince of Wales Island. Ketchikan: TSA Installing Advanced Imaging Technology at Ketchikan International Airport - The Transportation Security Administration (TSA) announced this week that Ketchikan International Airport and Juneau International Airport are among 16 airports nationwide set to receive recently purchased millimeter wave Advanced Imaging Technology (AIT) units. TSA plans to deploy the units to the airports in the coming weeks. The machines will be deployed with new automated target recognition (ATR) software designed to enhance privacy by eliminating passenger-specific images. The generic is identical for all passengers. AIT is designed to enhance security by safely screening passengers for metallic and non-metallic threats - including weapons, explosives and other objects concealed under layers of clothing. Southeast Alaska: IFA General Manager Retires - Inter-Island Ferry Authority general manager Bruce Jones has given notice of his retirement effective January 31, 2012, announced board chair Dennis Watson. He will be available to assist in the transition to a new manager. Jones joined the Inter-Island Ferry Authority in August, 2007 at a difficult time for the IFA, when the IFA was faced with having to discontinue service on the northern route between Coffman Cove, Wrangell and Petersburg, said Watson. After three summer seasons of service, traffic on that route did not come close to projections. Ketchikan: Governor’s Budget Funds New State Ferry - Governor Sean Parnell announced today that his Fiscal Year 2013 budget includes $60 million for construction of the new Alaska Class Ferry. A total of $120 million is available to begin construction of the new ferry in the next fiscal year. Ketchikan: ‘Tis the Season for the Audubon Christmas Bird Count - From Ketchikan to Prudhoe Bay to Shemya Island, every year Alaskans bundle up and gather together to celebrate the holiday season…by braving the elements for the Audubon Christmas Bird Count. Alaska: Historic Eagle Cannonball Provides Excitement - It was Eastern Interior Field Office archeologist Robin Mills who received the memorable phone call. An Eagle, Alaska resident had an old cannonball at her residence, and she was concerned it might still be dangerous. Mills passed the information on to the Bureau of Land Management’s hazardous materials and safety specialists. The 12-pound iron ball roughly five inches in diameter. A flurry of calls and emails ensued as the Alaska State Troopers, the National Park Service and an explosive ordnance disposal (EOD) team from Eielson Air Force Base were brought on board. Soon the EOD team set off on a 357–mile drive to Eagle to examine the cannonball. 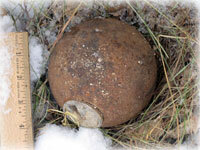 What the team found upon their arrival was a 12-pound iron ball roughly five inches in diameter. The cannonball was apparently found many years ago near Fort Egbert, a historic Army outpost established in 1899 to impose law and order in the Fortymile region during the Klondike Gold Rush -- Interior Alaska's first gold rush. The BLM now manages the fort, decommissioned in the 1920s, as part of the Eagle Historic District National Historic Landmark. Alaska: Troopers Preparing for Anti-DUI Campaign for Upcoming Holidays - According to the Alaska Department of Public Safety, the Alaska State Troopers will be out conducting extra traffic enforcement efforts to ensure the safety of Alaskans while they celebrate the upcoming holidays and ring in the new year. Local law enforcement agencies across the state will also participate in the enhanced enforcement efforts from Dec. 16 to Jan 2. Ketchikan: Bob McClory Named School Counselor of the Year - Bob McClory, a Ketchikan High School counselor for the Ketchikan Gateway Borough School District, has been named the 2011 Alaska School Counselor of the Year. McClory was chosen for his exceptional leadership skills, work ethic, and enthusiasm for the profession. Alaska: Water and Sewer Task Force Proposed; Legislation Needed to Ensure All Alaskans Have Clean Water and Safe Sanitation - Senator Albert Kookesh (D- Angoon) sent a letter to Governor Parnell, legislators, and various community leaders concerning a Water and Sewer Task Force. According to the Alaska Department of Conservation 6,028 homes across Alaska are without clean drinking water and safe sanitation. Alaska: Collection of Point Barrow Artifacts Returns to Alaska - A large collection of archaeological artifacts has returned to Alaska, nearly 60 years after the items were excavated near Point Barrow. The Birnirk collection represents a phase of prehistoric Eskimo culture dating back to 500 A.D.